Using leverage for your dollar in choosing your next holiday destination is super important. People sometimes focus too much on the hype from what they heard of some places without comparing them to others. An example of this is the typical holiday in Maldives or Seychelles as a beach destination. Having visited both a few years ago, I liked the islands but it definitely isn’t’ better than Thailand or beaches around Mexico and the Caribbean. Seems like all this publicity from Hollywood movies and advertisement in Forbes magazine worked out for them as people rank them as their “dream destination” while they can do a week to Punta Cana or the Riviera Maya for a fraction of the price. 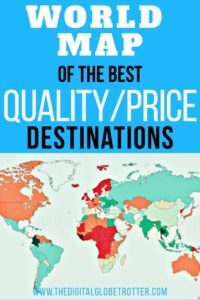 Same applies for Mountain destinations… why travel to the typical Swiss mountains or Western Canada, while you can get better quality mountains in Argentina and Chile for Cheaper and amazing ski! Or if you prefer hiking, why not choose to hike in the highest mountains in the world around Pakistan, Nepal or Tibet? Why is it only reserved for the experienced traveler? In my opinion, it shouldn’t and hopefully, in the future people won’t choose their future destination because of an ad in some magazine. 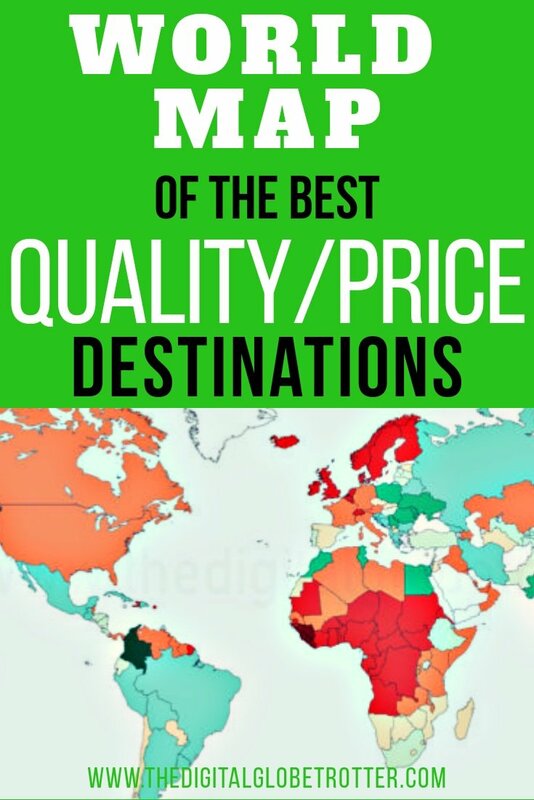 I prepared this Map a few months ago (before my last extensive travel in Africa, so it hasn’t been updated for those) to help out people in what I consider the best quality price destinations. 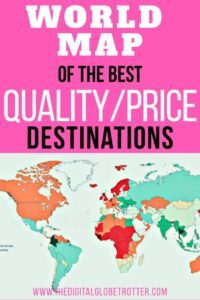 Get the most for your money is important in choosing my next destinations, and here is the best I could come with. 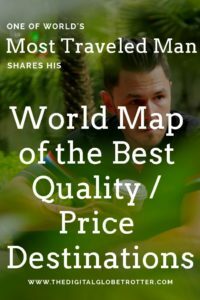 This will appeal to Digital Nomads especially since it is crucial to choose a place which can provide quality for what you pay. Why would I spend a month in Norway, having to live in a tiny home in a suburb, having to take the Bus for local transport, while for the same money I can live in a 20th-floor penthouse overlooking the black sea with infinite taxis for cheaper? The choice is pretty simple! South East Asia is definitely a winner here, as few paces in the world can rival with being able to live a whole month on some desert beach for less than a thousand dollars a month. 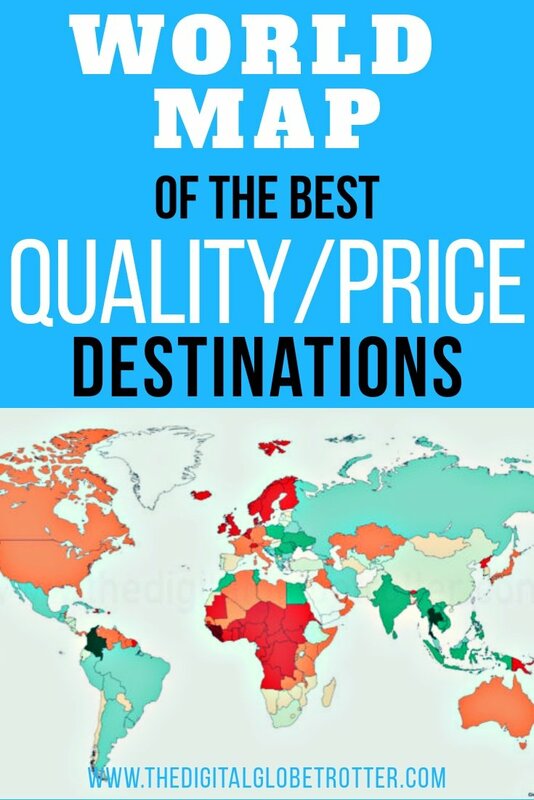 South America is also a great place to spend a lot of time to settle while working online. 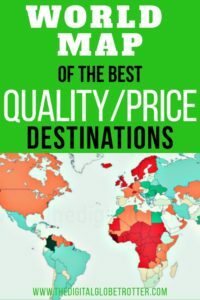 On the other end, Africa ranks pretty poorly on my map since contrary to common belief, it can be very expensive to travel around Africa. Travel infrastructure is reserved for elite tourism as local people don’t really understand and invest in tourism. Some countries like Western Africa, It was just impossible for me to Travel, like in Gabon or the Congo Republic where a simple 2-day trek in a nearby forest could amount to over 2000$. In those place, I content myself of experiencing local lifestyle and culture in the capitals. Tagged Africa, backpacker, backpackerlife, backpacking, backpackingdream, budgettravel, budgettraveller, digitalnomads, globetrotter, holidays, qualityprice, solotravel, thailand, traveladdict, Travelblog, Travelling, traveltips, world, worldmap, worldmaps, worldnomads. You can go on a safari for $50 (American dollars) a day in Lope National Park in Gabon. During my four days of safari there I saw lots of gorillas, mandrills, elephants and even a baby leopard. 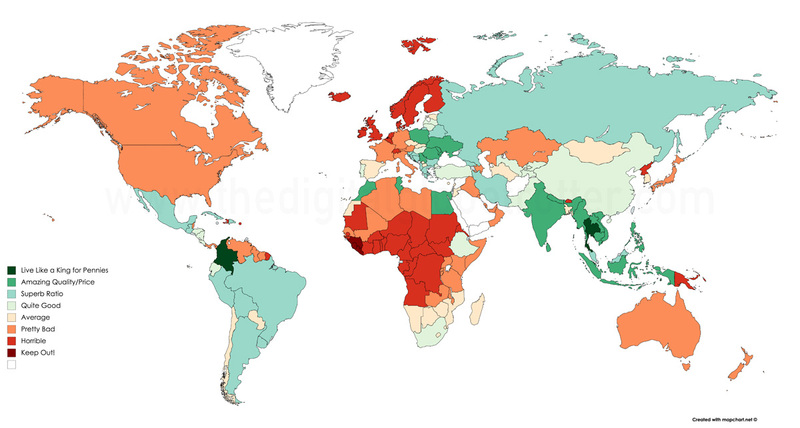 Like you said, Africa can be and usually is very expensive (visas). However one can work with it to travel around and see some pretty cool stuff on a budget. I agree that people in that region don’t understand tourism. It seems like there is a “get whatever you can from the foreigner while you can” attitude instead of “lets make this foreigner very happy so he encourages more of his friend to come and spend money” attitude, especially in Central Africa. Hopefully they can figure it out as Central Africa has some truly amazing places (Dzangha Bai being the crown jewel in my opinion). Don’t judge the region, or Africa in general off of its cities. The charm is in the villages, jungle and countryside.